ExploitShield Browser Edition protects against all known and unknown 0-day day vulnerability exploits, protecting users where traditional antivirus and security products fail. It consists of an innovative patent-pending vulnerability-agnostic application shielding technology that prevents malicious vulnerability exploits from compromising computers. Includes "shields" for all major browsers (IE, Firefox, Chrome, Opera) and browser all components such as Java, Adobe Reader, Flash, Shockwave. Blocks all exploit kits such as Blackhole, Sakura, Phoenix, Incognito without requiring any signature updates. No need to train or configure, ExploitShield is 100% install-and-forget anti-exploit solution. 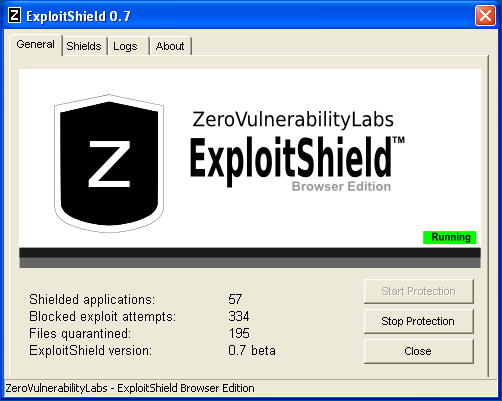 Read more: ExploitShield Browser Edition. The ZeroVulnerabilityLabs website maintains a realtime list of detected threats and their VirusTotal results.